Within the first few minutes of “Vigil,” the Morris Panych play just opened at the Mark Taper Forum, you are either laughing or deeply uncomfortable. Hold on to your hat, though, as you will soon seesaw between the two for the course of the show. This is the way it’s supposed to be. “Vigil” directly confronts the very things we least like discussing: familial obligation, death, child neglect and elder abuse. It does so with humor and pathos and a unique mixture of mystery and almost Sartrian self-imposed torment which is at once compelling and appalling. Panych readily admits changes which appear in his play each time he directs it, based on the performers’ spins on the characters. In this case, one could not have a more impressive cast, and the artistry shows. Marco Barricelli delivers what is virtually an episodic monologue as Kemp, a guy who rushes to the side of his dying aunt out of a peculiar combination of rather abstracted care and personality-wrenching bitterness. 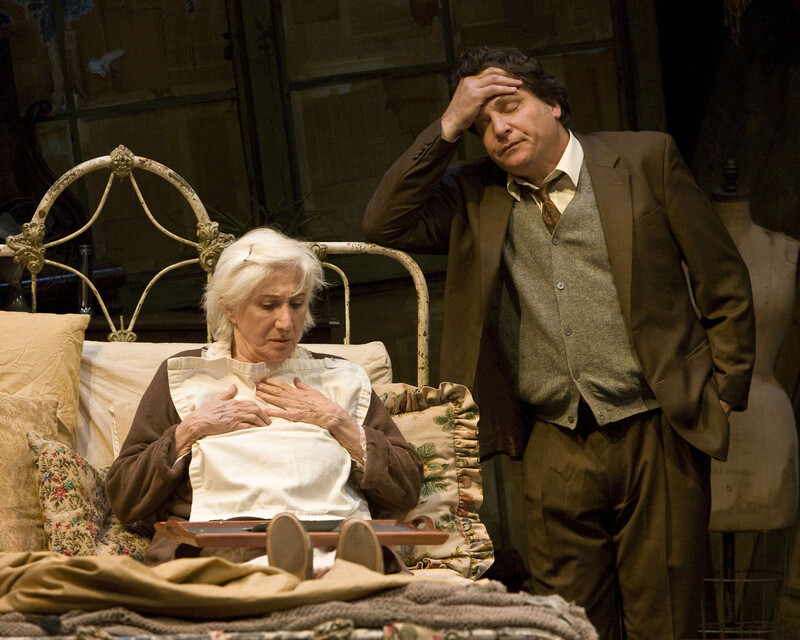 Olympia Dukakis’ Grace, confined both by circumstance and by Kemp to her bedroom, suffers indignities with an almost humorous creativity. What makes the entire play palatable, even able to be funny, is this sense that despite its weird dysfunctionality, this relationship between Kemp and Grace works for them both. Much of this has to do with the chemistry and artfulness these two bring to their roles. Barricelli displays Kemp’s inner turmoil in physically interesting ways which often seem a counterbalance to the intensity of his speech. This is a man turned in upon himself – useless and disconnected when in the world outside. Self-satisfied at his own agendas, he tends Grace’s needs even as he waits for her demise. Yet this is also a man so desperate for understanding that he spews his entire life story like a man bubbling with a perverse joy that someone is there to be audience. Creating the edginess of the character, yet keeping it in balance with Dukakis’ calm, makes for fascinating theater to watch. Dukakis’ nearly pantomime performance proves endearing, but more than that. There’s something rumbling under all that docility. It becomes the work of the audience member to try and figure out what, before Kemp does. Dukakis’ economy of physicality, her pinpoint timing and the rhythm these two fine actors develop between them is a lesson in acting. Which does not make this a simple play. Alan Brodie and Robert Hahn’s angular, cluttered set hints at both the decay and the chaos of life. The character studies leave one food for thought. Even the often humorous reference to modern man’s lack of attention to detail pokes at modern society’s levels of isolation and general lack of focus. It makes for good conversation on the way home. “Vigil” moves an audience from that feeling of watching an accident happen in slow motion, to curiosity, to a slightly bent sense of empathy, all propelled by laughter. That makes for an unusual evening of theater. Put that together with a chance to see great artists making the extraordinary things they do look easy, and you can anticipate quite an adventure.